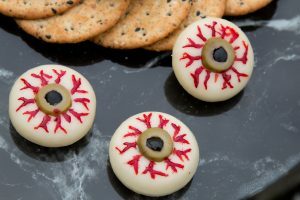 Halloween is on it’s way and here on Steve’s Kitchen we always like to make something a little bit special. These Mini Babybel Cheesey Eyes are a savoury treat that will go down well at any Halloween party and they are super easy to make. Share this Video with a friend and let’s have fun this Halloween. Unwrap the Babybel Cheese and using the tip of a sharp knife make a small circle in the centre about the size of the green olives. Remove the circle of cheese you have made by making a smaller circle but angling the knife tip a little. Cut the green olives in small slices and place in the hole you have created. Cut the black olives in halve length ways and then cut that piece in half again. Nip off each end and you should be left with a square piece of black olive. Place that inside the green olive ‘iris’ and ease inside the hole to form the ‘pupil’. Now take the red food colour and using a toothpick or small paintbrush make some small red squiggly lines coming away from the centre to the edge of the cheese. 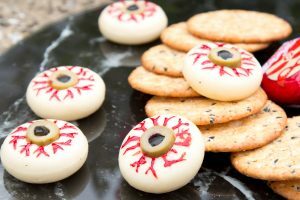 This will make the eye look bloodshot. Your Cheese eyes are ready to be served.